A short while ago, I visited the historic Aztec Hotel, an odd 1920s Mayan revival building located in Monrovia, California. While there, I met artist Jorge D’Soria, who recently returned to the hotel after an nine year absence. Jorge once lived at the Aztec from 2006 to 2009. While there, he discovered the hotel’s original “God of Lust” mural covered by a piece of white canvas in the lobby outside the women’s restroom. Excited by the discovery, the hotel owner hired Jorge to recreate the “God of Lust” mural on a new piece of canvas. Once the duplicate was completed, Jorge secured the canvas over the original wall mural. 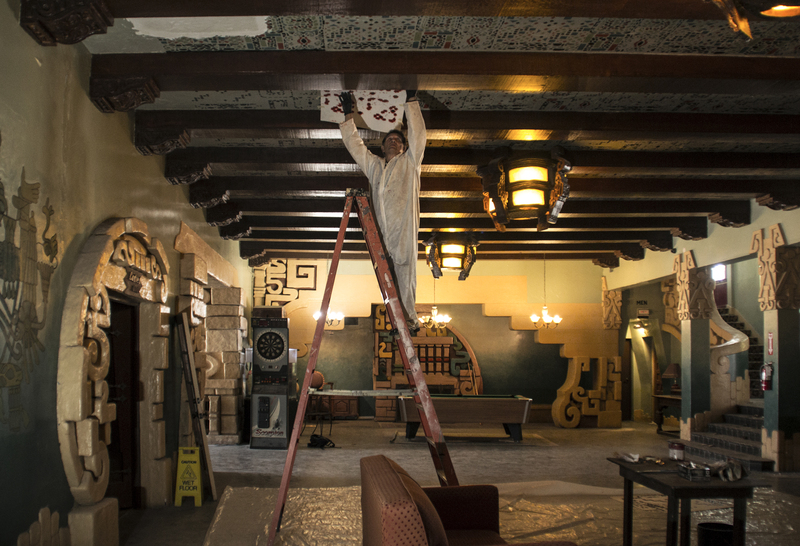 The owner then hired Jorge to paint original wall murals inside the former Brass Elephant, the women’s lounge, and courtyard. He also painted the stone floor tiles in the courtyard. 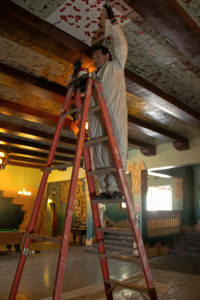 In 2008, Jorge began painting the Aztec Hotel’s ceiling. However, when money for the project ran out, he stopped. As a result, the ceiling’s paint job remained unfinished until 2016, when the hotel’s manager hired him to complete the project. 2. He has a knack for hiding his likeness or initials in the art he creates. 3. He was born and raised in Mexico. The new ceiling is based loosely on the original 1925 design. 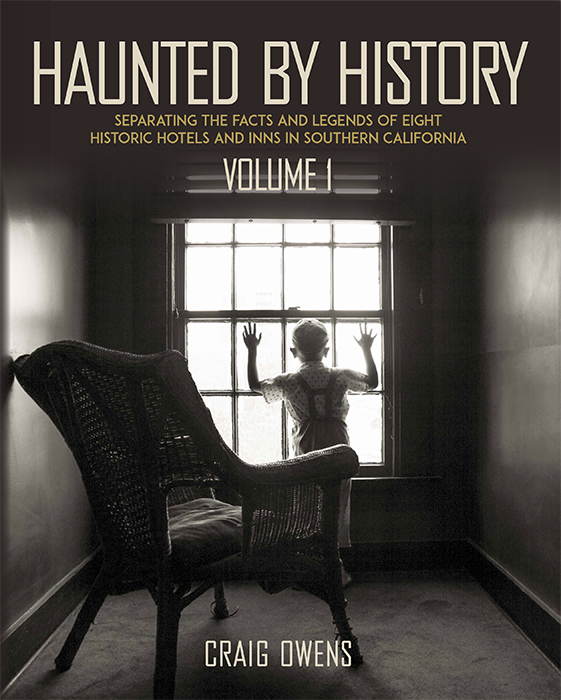 Yours truly, acting as an agent for the hotel, secured a couple of historical photos from the University of California Santa Barbara to help with Jorge’s recreation. The photos, however, only provided a glimpse of what the original ceilings looked like.